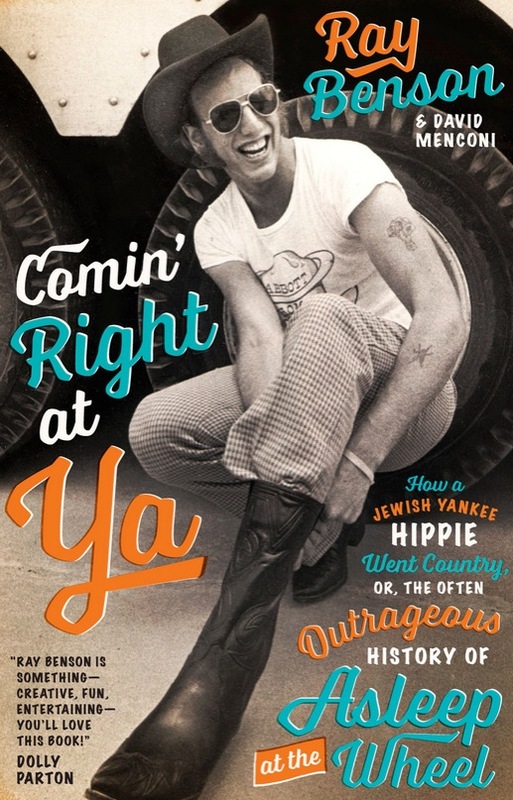 “Comin’ Right at Ya: How a Jewish Yankee Hippie Went Country, or, the Often Outrageous History of Asleep at the Wheel” by Ray Benson & David Menconi was published Oct. 1, 2015, by University of Texas Press. Find it on amazon.com, bn.com or iTunes. A pleasure for fans of Benson and the band. The man is a trip, literally and figuratively…a real relaxin’ ride with a mellow fellow. A memoir that’s nearly as much fun as one of his shows. One helluva ride worth telling. Benson’s storytelling chops and Forrest Gump-caliber life live up to that billing. …shows the power of persistence and reinvention when a Jewish boy from the burbs of Philadelphia can become a bonafide Texan country-western star. What a marvelous book, such a delight to read. It evokes so many memories. And what a great band with so many brilliant albums and so much fantastic music! I have so long and deeply loved Asleep! But I think the greatest achievement was to find so many photos without Turk Pipkin in them! Benson is a hell of a great storyteller who grabs our attention with a great anecdote, entertains us with the story behind it and then moves on to the next tale, keeping us turning pages eager for the next chapter of his chronicle. There might be stranger musical journeys than the one that took a nearly 7-foot-tall Jewish pot smoker from Philadelphia to Official Texas Musician of the Year in 2004, but I doubt they are as funny and uncensored as Ray Benson’s. Highly recommended. David Menconi is an old pal, and while Ray Benson is a legend and tells incredible stories of his life in music, my favorite part of the book is discerning how David’s voice meshes with Ray’s. Maybe it’s ’cause (that’s right) they’re both from Texas. (Although Ray is really from Philly.) A great book and everybody should buy it immediately!